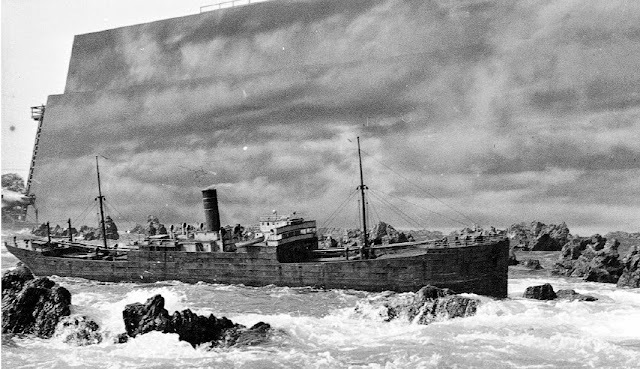 In miniature visual effects work usually the maxim "simpler the better" is employed and most miniature ships have been moved across the tank by pulling an underwater rope. Usually divers are employed to man-handle the ship into position and to stop it before it hits the wall of the tank. Sometimes a ship might be moved during the shot by a hidden diver on the off camera side of the model. Although I'm using the term "diver" here, in 1 meter of water aqualungs aren't usually required. In fact where i say diver substitute a technician in a wetsuit or waders. The diver needs to be fit as they will spend a long time in the water during shooting and will also need to be pretty strong. Because the models are usually shot at an over-cranked camera speed they need to be moved pretty quickly through the water. The miniatures can have a great deal of mass when ballasted to sit at the correct water level, making them very difficult to stop when moving at speed. In the past there was two schools of thought in regard to the building and moving of these miniatures. The British system referred to the models having an open bottom, having no buoyancy, not needing any ballast and riding on trolleys on tracks set on the bottom of the tank. This meant that the models were not at the whim of any waves in the tank and rode steadily in all seas. For smaller scales of models this was probably an asset as it precluded any unnatural bobbing up and down, to give away the scale. The "Graf Spee" model from Battle of the River Plate showing a bottomless hull in the British style. sitting just above the low water surface. An elaborate support made from what looks like scaffold pipe. This would normally be under the water surface. Underwater pump nozzles creating a slicing bow wave. Here the model is stationary, the motion of the water gives the illusion that the ship is underway. A shallow tank, only about ankle deep inside the studio. The American system on the other hand was to build the models as ships, ballasted to float at the correct water line and free to interact with any waves thrown at them. This means a system of ballasting needs to be employed, preferably one which takes place after the model is moved to the tank. The obvious answer is to provide containers that can be filled with water once the model is floated. Sometimes sandbags are placed into the hulls or lead shot. Any batteries used for practical lighting can also figure in the total ballast. Most radio control ship modelers are surprised at the amount of ballast required for their relatively small models to be brought to the waterline,. When the models are 40 feet or more long, you can understand that the issue of ballast needs to be considered very carefully indeed. 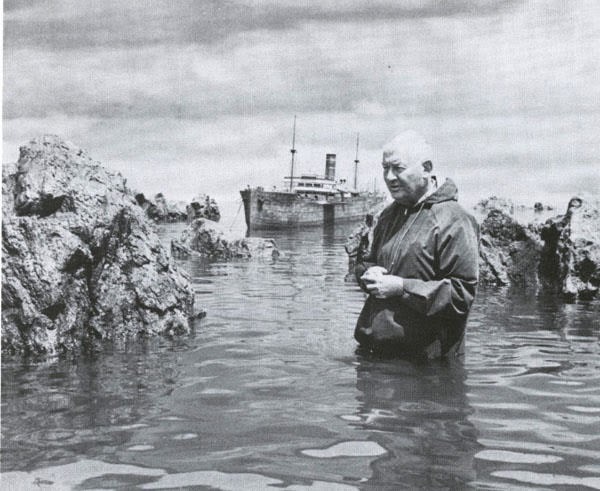 A Arnold Gillespie in the MGM tank with the Mary Deare ship ballasted to float at the correct waterline. The Mary Deare in the outdoor tank. Note an extension to the sky backing. Most ships are turned by the action of the rudder which is generally at the rear of the vessel. This means that a ship is turned by swinging the stern around at the rear. To get a model ship which is being pulled by a rope attached under the bow to turn accurately requires the pulling of a second rope attached at the stern to simulate the action of the rudder. It is not uncommon to find aspects of these models operated by an effects man concealed within the model. He may be employed to operate a rudder, pull on running rigging ropes to set sail angles, fire miniature cannon, or actually pilot the thing around the sea. The huge 60 foot oil tanker built by Derek Meddings' crew for The Spy Who loved me was reportedly operated from within the catamaran like hull. The catamaran layout was to allow the bow to open and swallow a large model nuclear submarine. Wolfgang Peterson mentions on the DVD commentary for Das Boot that originally the largest U-boat model (11.2 meters/37 feet) was controlled by a diver concealed inside, but he became very seasick and subsequently the sub was towed by a boat out of shot. In more recent years radio control has been employed as it has got more reliable and less prone to interference. An out of control model 6 meters long could do some serious damage both to itself and any one in its way. Where a shoot takes place on the open ocean, auxiliary boats are used to tow the models on a long submerged cable so they keep out of shot and don't leave an unnatural wake destroying the scale of the shot. Shooting of any sort is notoriously difficult at sea due to the unpredictable nature of the weather and waves, that and coordinating a camera boat and tow boat to get the perfect shot. It is for this reason that many Hollywood studios built their own tank facilities.